I’m not your regular thrill seeker. To be honest, I’m more like a creature of comfort. Keep warm, stay dry, avoid any unnecessary risk. That’s why the very idea of jet boating, in particular Agrojet, the world’s first ever commercial jet boat sprint at Velocity Valley and testing out its purpose-built course especially designed to unleash 3Gs of force to the fullest, well, it’s a bit unnerving. Do I really need to find out what riding a super-fast Ferrari on water feels like? Not 1, but 3 hot laps around the custom track, at 100 km/hour, come rain or shine, certainly faster than I would ever drive in wet conditions. Isn’t that what they teach you at driving school? That water and speed don’t mix? Is it OK to trick myself into the idea that a jet boat ride in Rotorua may actually be a good idea? That I may even enjoy it? Do I just jump on board Agrojet at New Zealand’s fastest jet sprint, with someone I’ve never met before, and trust that all things will go well? But besides the fact that I may not have all the typical characteristics of an adrenaline junkie, I know how amazing it feels to push yourself out of your comfort zone and test your boundaries. The whole daring greatly kind of thing. Every so often I get this craving to do something different and a little bit unexpected. It can be the simplest of things, like taking a different route to work, or starting a conversation with a complete stranger. Either way, it’s moments like this that I learn something new and as importantly learn about what I am made of and who I am as an individual. It’s not every day that you get the chance to scream like a baby with your hands up in the air. And it’s not every day that you get to feel what it’s like to fly on water. Rotorua’s Agrojet at Velocity Valley is your ticket to uninhibited, exhilarating fun. You could nicely ask the driver to take things nice and slow or you can just smile quietly and find out why faster is better on water. You could make use of a poncho provided or you can politely decline the offer and embrace the sensorial experience and feel the rush of it all. You could even bring a friend along for the ride and discover together the real reason why in the 1950’s New Zealand’s Sir William Hamilton invented jet boating in the first place. 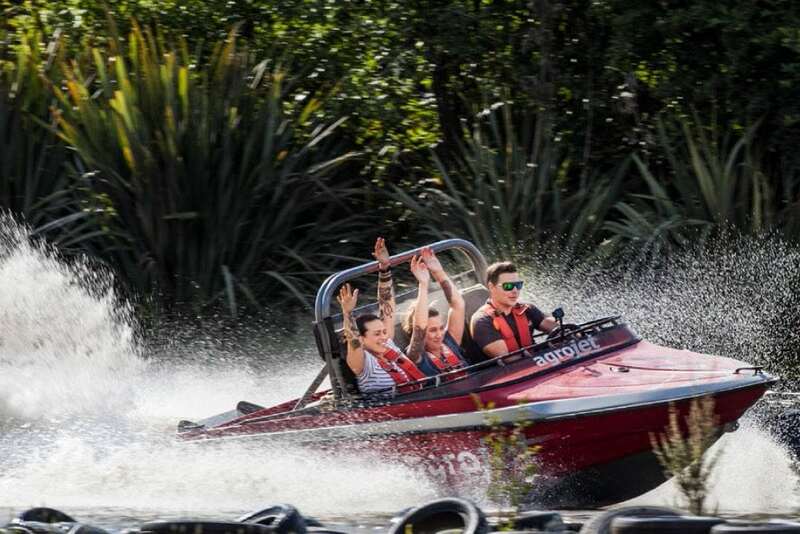 The thrills, the spills, the twists and turns, jet boating in Rotorua is calling my name. Agrojet is synonymous to adventure – the kind of adventure that reminds you to seize the day, to find gratitude in the ordinary and extraordinary and simply make you feel alive.